um quando você entra no apartamento que você está no jardim. Aqui você pode compartilhar o seu copo de vinho com o seu parceiro ou simplesmente ler um livro cercado por edifícios antigos da cidade. O apartamento é constituído por três pisos. Do lado de fora você pode ir pela porta principal ou você pode chegar ao segundo andar pelas escadas ao ar livre. O piso térreo é o lugar onde você pode encontrar a casa de banho e cama king-size. Então você vai para cima através das escadas e chegar ao primeiro andar, onde há apenas uma cama para um ano e meio. O segundo andar é onde você pode encontrar a cozinha com todas as comodidades: máquina de lavar louça, máquina de lavar roupa, owen, frigorífico e frezeer e assim por diante. O custo da limpeza final e '50 € Aquecimento não está incluído no preço. Lucca was a welcomed change to the hustle bustle of larger cities. The apartment was within immediate reach of all your needs and interests. We did make use of the charming courtyard just outside the downstairs bedroom. A narrow circular staircase took you upstairs to the kitchen and living area. The lighting on the stairwell could be improved. The kitchen was well equipped but needs basic reusables such as paper towel, salt, pepper, olive oil and balsamic vinegar. You don’t normally travel with these things. The opera performed nightly is an absolute must see. Perfectly safe walking back to our cosy flat later in the evening. The bus station is just 5 min away and we took a day trip to Pisa and moved onto Florence using the bus. All good. Thank you Susan, it was marvelous to meet you and your husband. I hope you will come again for Puccini opera!!! So I will wait for you!!! Paola ist eine sehr herzliche Gastgeberin. Die Wohnung ist gut für 3 Personen geeignet. Das dritte Bett ist auf einer offenen Gallerie. Wir haben es genossen schnell im quirligen Zentrum von Lucca zu sein mit Geschäften , Restaurants aller Art. Auch kochen ist in dieser Wohnung in der Küche , die sich oben befindet gut möglich. Wir haben alle Utensilien, die wir benötigten vorgefunden. Besonders schön ist es in dem Innenhof umgeben von großen Pflanzen zu sitzen. Die Wohnung ist auch an heißen Tagen gut temperiert. Wir haben an einem Tag eine Fahrradtour mit E Bikes durch die hügelige Umgebung gemacht. Das war ein wunderbares Erlebnis. Dear Petra and Michael thank you for your Message . I Try always to make happy my guests . With you it has been so easy!!!! We stayed here for 4 nights last week and we enjoyed our stay. The main reason for this choice was the outside space and this is lovely. It was easy to find. After arrival at Pisa we caught the blue VIA bus from the airport for 3 euros and arrived at Lucca bus station which is literally a few minutes walk from the apartment and easy to find. There are many buses to lots of different towns and a railway station just a little further which can get you to cities further away. The facilities are basic, however the kitchen is fully equipped with everything you would need. The outside stairs are really useful to get breakfast down from the kitchen to the patio as the spiral staircase inside scared me a little. Outside of the apartment there is everything you would need shop wise and restaurants everywhere. We didn't have a bad meal there and it was not expensive. Lucca is a beautiful city oozing with character and there's always something going on. If I come back for a longer visit, I would definitely stay here again. Thank you to Paola for her welcome and explaining a little history of the apartment. My impression of Lucca and of landlord Paola I have put into my heart. We had the best 3 days there and was taught to make pasta. Really a lovely family, thank you for being part of you. Thank you and i love my guest!! I want all love italian pasta!!! I wait for you again!!! A very unusual house! Steeped in history and character. Paola the host was attentive and ready to help on any way she could. There was no description of the layout of the flat provided and had there been we would probably not have booked it as an older couple due to the number of steps involved to the living area. 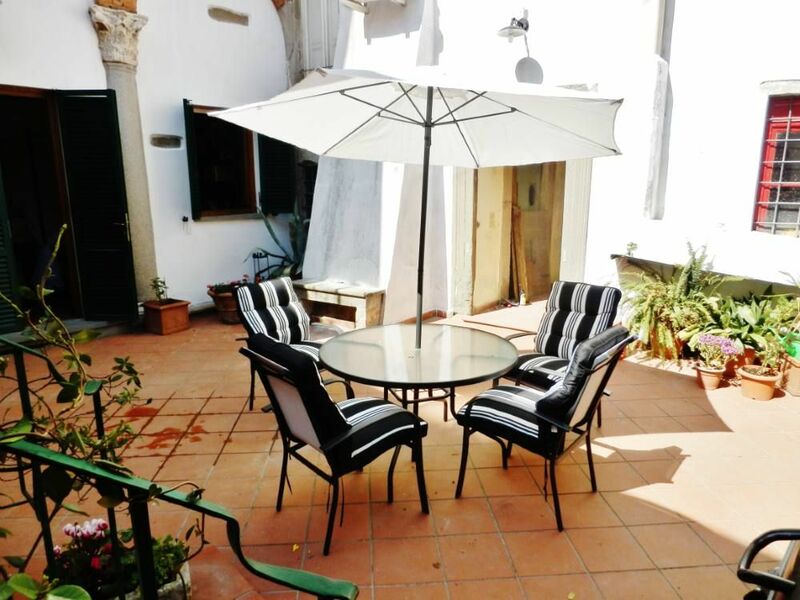 There is a lovely courtyard with table , chairs and parasol (for sole use but overlooked by the surrounding houses ) which leads into the attractive vaulted brick ceilinged bedroom downstairs. Downstairs there is also the very small bathroom containing a washbasin, toilet and shower ( no bidet ). There is a corner spiral wooden staircase in the bedroom which leads to a mezzanine after 10 steps, enough room for a large single bed. The staircase continues for another 10 or so steps up to the small dining room and kitchen area. In the dining room are two small comfy chairs , behind the table which is too big for the room size and number of people and if it was smaller would create a greater feeling of living rather than dining space. The dining room and kitchen area are warm, light and bright, the bedroom and bathroom not so much. You can access the courtyard from the kitchen balcony, down a steep staircase. An 'upside down' arrangement of the flat as the living area is upstairs. Paola was very welcoming and helpful , telling us about the nearest supermarkets , good restaurants , rubbish collection etc.The position of the flat for visiting lovely Lucca was perfect.